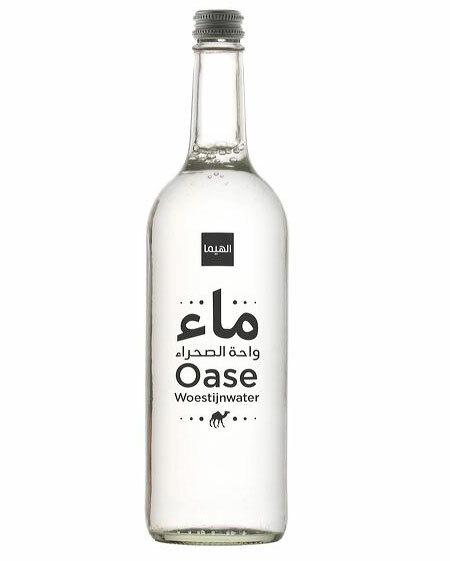 Water bottle packaging for the El Hema Oasis Desert water. El Hema, the Arabic fictive (yet real) version of the famous Dutch HEMA department store, is back again this year, with an exhibition (or rather a store) in Rotterdam. El Hema, originally an idea of Mediamatic, was organized this year through cosmopolis, in collaboration with the brand hotel, and we were glad at Tarek Atrissi Design to be commissioned for the design of the main graphic and information design work involved in the project. Above: Preview of the visual identity of El Hema, basis of the design work developed. The identity witnessed some minor adjustments, based on new briefings and some new changes in the HEMA identity; It built further on the identity developed by the Mediamatic Design team of Amsterdam 2007. The Square El Hema Version logo was back then design by Wael Morkos. In 2007, the first El Hema project in Amsterdam organized by Mediamatic took an incredible press attention and was a big success: It was simply very unconventional to see a brand that is so Dutch, HEMA, taking a small twist and becoming in an Arabic form. A simple idea that reflects much more on the highly debated cross cultural integration and communication in the Netherlands. In 2007, we designed at Tarek Atrissi Design the Arabic logo of El Hema, working the Arabic lettering version to match the simple straight forward typographic Latin logo. 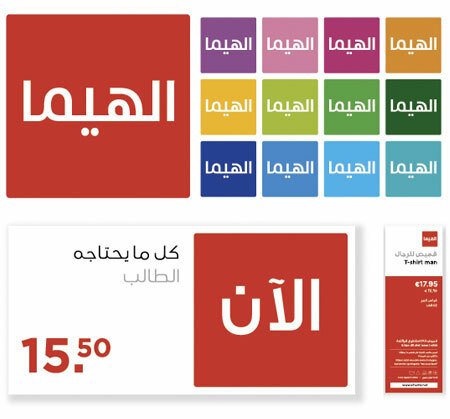 Above: Images of several items of the new El Hema collection, mostly typographic design solutions for intercultural concepts and ideas. This year, with the concept slightly changed and a new wider line of products, our work mostly focused on the design of new products (Fashion and kitchen items), as well as a lot of packaging design for food and non food products, and retail and store interior design. We had a new briefing that slightly differed from the first concept we knew: As a successful idea, El Hema was carried as a concept to reinforce the richness of the intercultural living in Holland; but mostly was developed to be a successful business model, generating profit through sales of its unique products in order to support the grow of the collection, and the move the of the El Hema exhibition to other major cities in the Netherlands. The strongly cultural initial essence of the concept, had to be then combined with a business viability that will insure its continuous sustainability. Artwork preview of some of the food products packaging. Shown above the Ksar Bahia and Musar wine Label design, as well as the Chocolate packaging. Most of the items were very interesting to work on: Graphic and Typographic solution for wine labels, chocolate packaging, water bottles, Duo umbrellas (with fairuz’s famous rain song), imported food, and much more; all with an intercultural twist. The focus remained on making a balance between the initial El Hema identity and drawing a parallel line with the real HEMA look- that has changed a lot over the last year with the introduction of a revised look and feel. Images and impressions from the actual El Hema Exhibition & store in Rotterdam. El Hema project seems to always come with its own challenges and problematic issues. Amsterdam’s mediamatic exhibition was faced by an initial unpleasant reaction from the Dutch Hema department store. This year, the difficulties were faced by the fact that many organizations and parties were involved in the project, and not all of them shared necessarily the same vision on some key issues for the El Hema brand, particularly that the concept has moved from its initial “home”. Not to mention of course an incredible short deadline, by which an entire department store had to be designed!